To search, click on title. You can then download or click Read Online to view. Note: the Optical Character Recognition (OCR) for some of the titles in the Internet Archive project is not very good, it is, therefore, advisable to check the list of contents for each volume when searching. You can only search one volume at a time. For a bibliographical record of this magazine see this link. 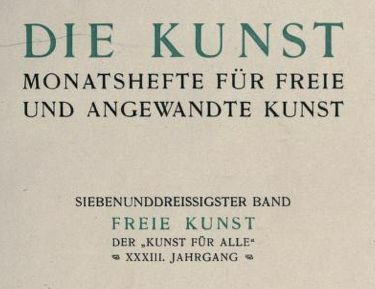 Note: the even volume of Die Kunst (e.g. 2, 4, 6, 8) incorporate its sister decorative and applied arts journal Dekorative Kunst which was also published separately by F. Bruckmann A.-G.